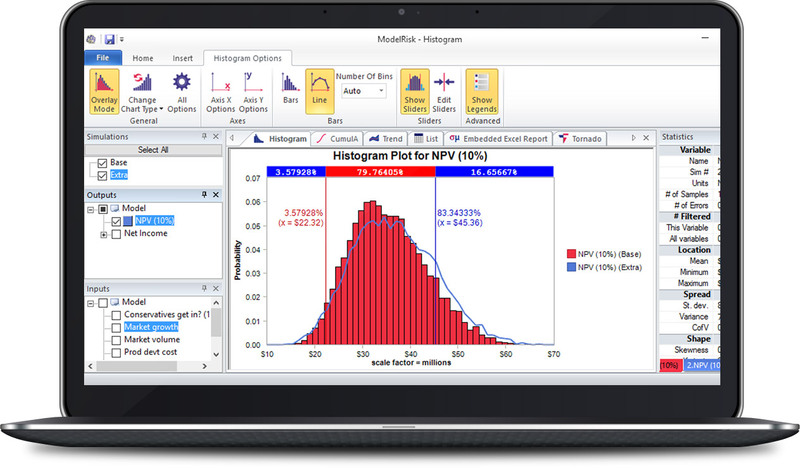 A histogram plot is an intuitive description of the distribution of possible values of an output. It shows the range of possible results on the horizontal axis, and how relatively likely the values are on the vertical axis. Its key advantage is that one can see which value are more likely, but it is less useful for reading off probabilities since these depend on the bar widths. 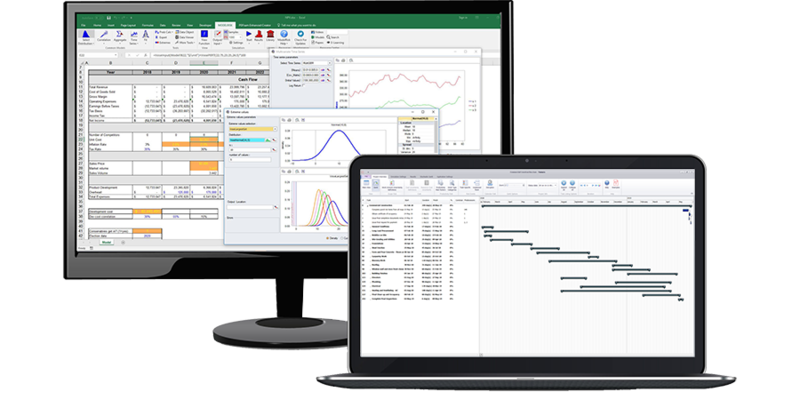 Each variable can be shown as a line or bars, which makes the plot easier to read when plotting two or more variables. 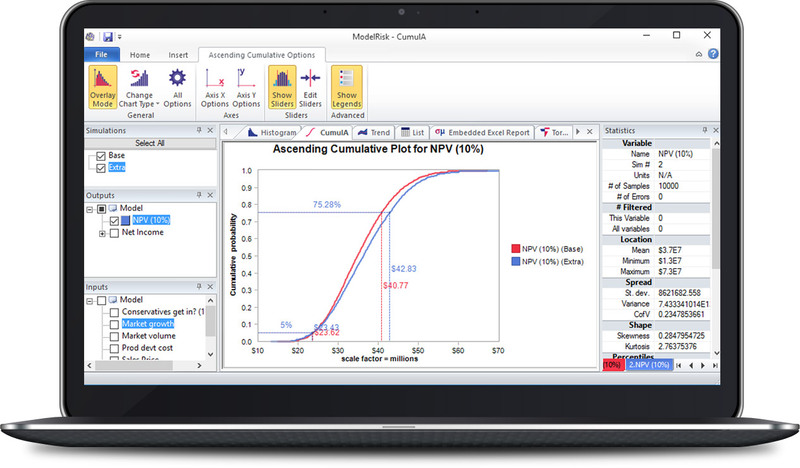 A cumulative plot shows the range of possible values of a model output on the horizontal axis, and the probability of being below that value on the vertical axis. 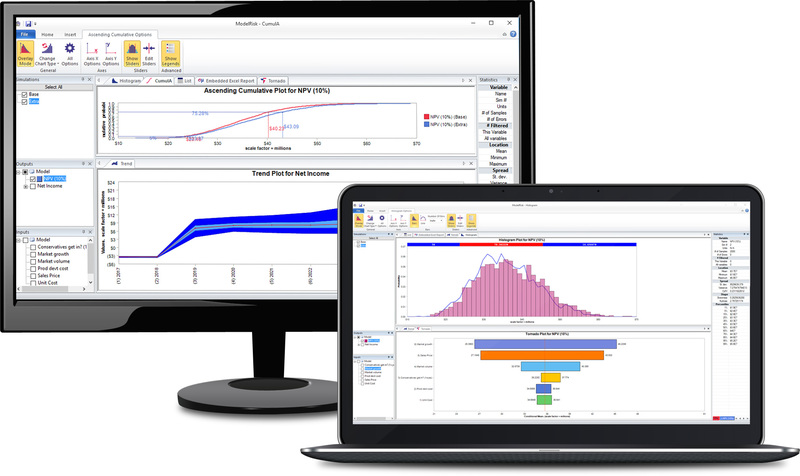 Its key strengths are that one can read off probability values, and one can plot two or more outputs together – for example to compare two different options. Ascending (probability < x ) and descending (probability > x) are both available. 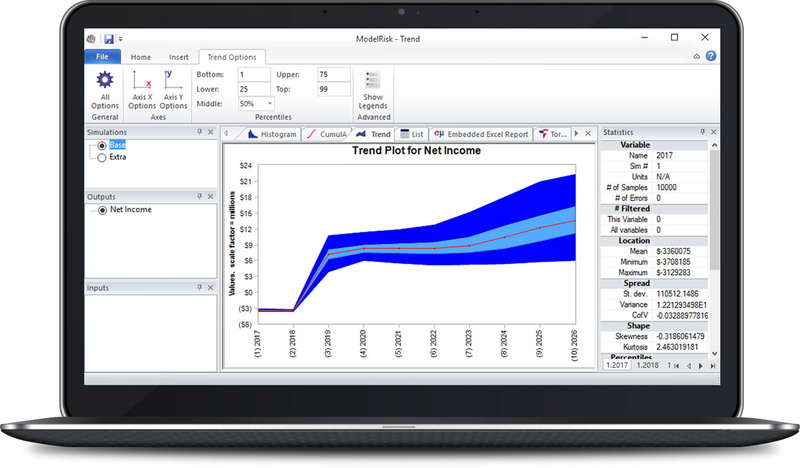 A trend plot shows the range of possible values of a model output that covers several periods (for example, cashflow). The horizontal axis shows the period (e.g. year), and the variable is represented by several bands around a central line (in red, either the mean or the median). The bands reflect probability ranges – here the light blue areas cover the P25 to P75 range, and the dark blue area covers the P05 to P95 range. These P-values can be customized. This table shows which values have been generated for inputs and outputs during a simulation run. It provides a useful check on how the model behaves. 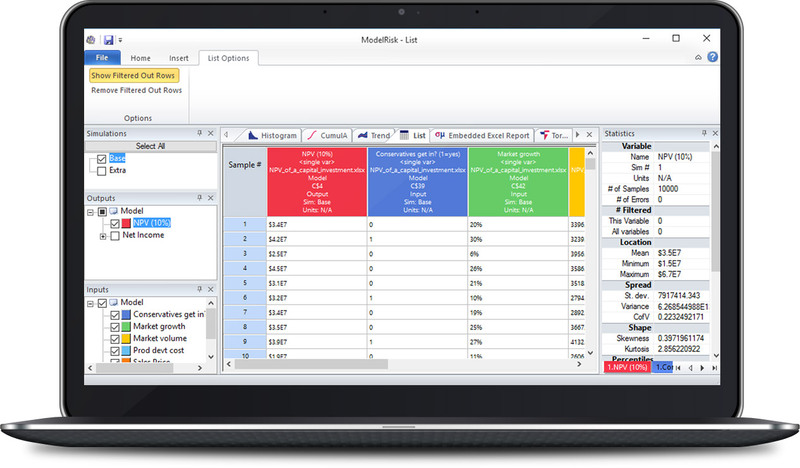 When the Results Viewer is used in combination with ModelRisk, a particular sample can be selected, making ModelRisk show the whole spreadsheet with the calculations for that sample – very useful when, for example, the model has generated an unusual value or an error and you want to see how that happened. Tornado plots show how sensitive the model output is to the different uncertain inputs. 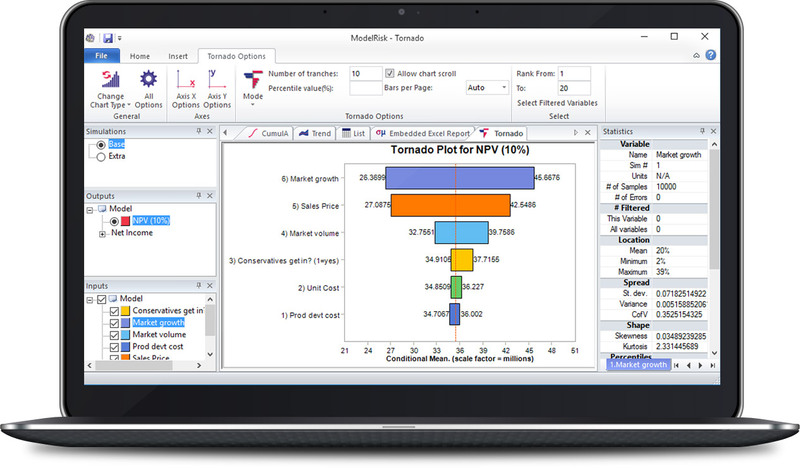 ModelRisk has several versions of the tornado – the one illustrated is the conditional mean tornado, first developed by Vose Software, and now the standard tornado plot for risk analysis. This plot shows how two variables behave together (two inputs, two outputs, an output or an input). Each dot represents values that were generated for a single sample of the simulation. 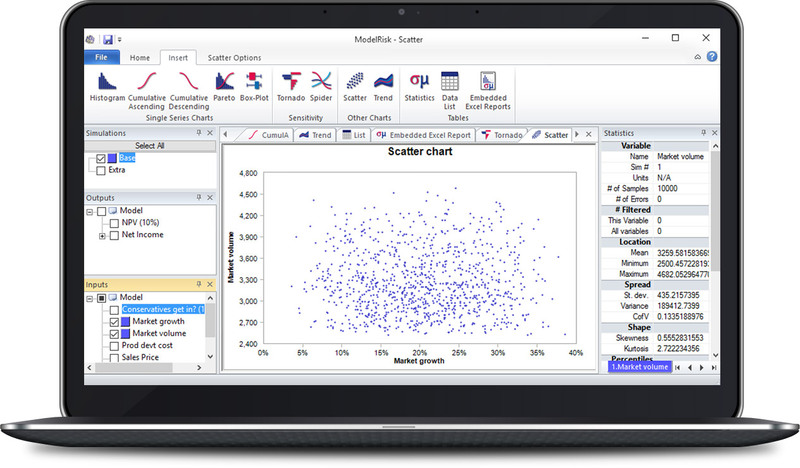 The scatter plot provides the most detailed visual description of how two variables behave together. 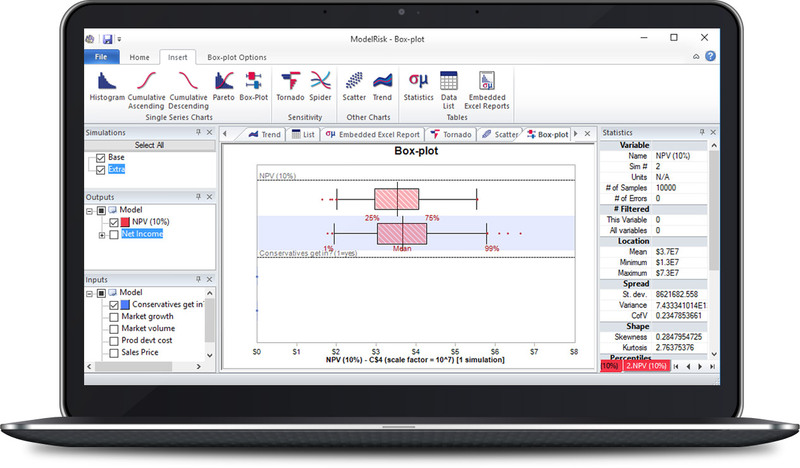 The box plot shows the range and selected probability measures for a variable on a single horizontal line. Its clear, simple presentation makes it ideal for comparing several outputs together.